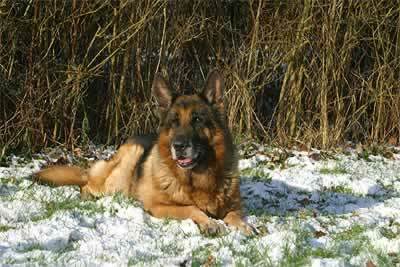 In August 1995, Ulk von Arlett had become the World Sieger German Shepherd Dog. I had seen his photograph and been impressed by him. He had garnered all the accolades that a German Shepherd Dog could, and was to become the European Champion of all breeds in 1996. He had also shown some of the largest and best progeny groups at the World Sieger Show in Germany. But Ulk was not only known for his beauty, but also for his superb character. Ulk�s progeny had also proven Schutzhund working ability, with one of his sons, Lasso vom Kampchen, destined to be the first Universal Sieger in Germany, a title awarded to the dog that attains the combined best conformation standing at the World Sieger Show and in Schutzhund at the Bundessiegerpruefung in Germany. Another one of Ulk�s sons, Rikkor von Bad-Boll, would become World Sieger twice, in 1998 and in 1999. Jutta�s hometown, Wuppertal, was very close to Koln, where, I discovered, the Arlett Kennel was located. I was interested in seeing Ulk, not only because of his reputation, but to see how the ultimate German Shepherd Dog looked.